The 33rd Totsugeki Unit, made up of the 3rd, 5th, 9th, and 10th Kaiten Squadrons, deployed 26 kaiten human torpedoes to the east coast of Miyazaki Prefecture starting in the spring of 1945. In preparation for the possible Allied invasion of the Japanese mainland, the Navy gave priority to establishment of land bases (with kaiten human torpedoes and shinyō explosive motorboats) that faced the Bungo Straits on the coasts of Miyazaki and Kōchi Prefectures. The headquarters for the 33rd Totsugeki Unit and the base for the 3rd Kaiten Squadron with nine kaiten human torpedoes were located in Aburatsu, which is now part of Nichinan City. The 5th Kaiten Squadron, which trained at Ōtsushima Kaiten Base in Yamaguchi Prefecture, had seven kaiten at its base in Nangō Town, also now a part of Nichinan City. The commander of the 5th Kaiten Squadron was Hiroyuki Nagami, a reserve officer who had attended the Navy's Torpedo School. The six squadron members were in the 13th Kō Class of the Yokaren (Naval Flight Training Program). Four came from Nara Air Group, and two were from Tsuchiura Air Group. The 9th Kaiten Squadron from Hikari Kaiten Base in Yamaguchi Prefecture had six kaiten human torpedoes at its base in Uchiumi, now in the southern part of Miyazaki City. The 10th Kaiten Squadron with four kaiten was formed at Otsushima Kaiten Base on August 14, 1945, but never reached its destination of Ōdōtsu, now part of Nichinan City, before the end of the war. This location is the sea where formerly crewmen of the 33rd Totsugeki Unit, concerned about the fate of our country, kept up rigorous training. As the years have gone by with changing fortunes, we celebrate the magnificent scenery of the Nichinan Kaigan (Coast) Quasi-National Park. In the outline of these islands, we remember the traces of the blood-stained rigorous training of the precious young men who yearned for victory in the Greater East Asia War and who valued eternal peace. We erect this monument as we cherish the memories of our comrades who died for their country and as we pray for everlasting peace. The back of the monument gives the erection date as August 15, 1968, by the Kaiyu Association. 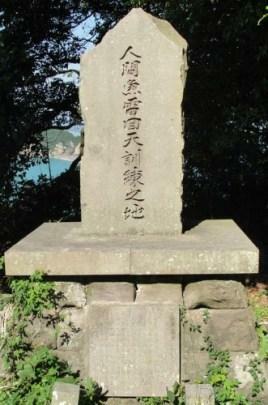 It also indicates that Yoshimitsu Yano wrote the monument's words. The men of the 33rd Totsugeki Unit ended the war without any kaiten human torpedo ever making a sortie against enemy ships. The coast of Miyazaki Prefecture also had several bases for shinyō explosive motorboats to make suicide attacks on enemy ships if they approached the shore. These shinyō bases included ones at Ōdōtsu, Hososhima, and Totoro.